When Michelle Vella started her graphic design business in 2005, she was thrilled that she could actually be creative and own a business at the same time. “I was a self-taught graphic designer and thoroughly enjoyed designing logos and branding, but after ten years, I was yearning for something even more creative,” she says. This week, we asked Vella about her career pivot, how to make a living out of creating art, and her mantra these days. SDTC: A lot of artists struggle not with producing work but with getting the work to their audience/buyer. Any tips on how they can make that happen? MV: I found social media, art shows and pop-ups a great source for building an audience and attracting buyers. Instagram connects you to people you would not necessarily have the ability to reach. For instance, Diane von Furstenberg and W magazine found me on Instagram, creating and fostering a connection that would otherwise be near impossible to do. Facebook is a great resource to show and sell my art to friends, friends of friends and the public. It was a fantastic way to get commissions and sell art. Art shows grew my clientele and mailing list and gave me a direct connection to potential buyers, boosting visibility so people could see my art in person. Holding pop-ups is my new favourite way to showcase my work and merchandise. Now that I have expanded my business to include a fashion and accessory collection and soon to have a home collection, I found having a retail outlet is crucial to building my brand and sales. It is also very profitable. Pop-ups allow you to test different locations, markets and demographics. Another tip: have a good website. A Shopify website is fantastic as it connects to Instagram and Facebook, making it a great way to sell merchandise and prints; however, in comparison, art shows and pop-ups sell original art better. Tell us the Diane von Furstenberg story. How did that play out? 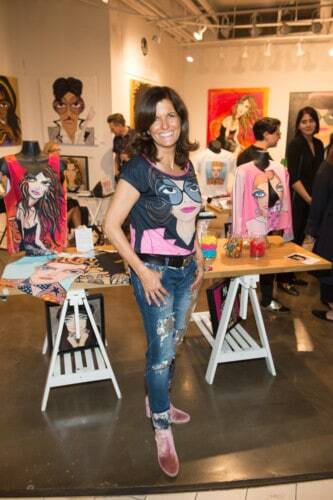 One day, I painted Diane von Furstenberg’s portrait and decided to post it on Instagram and Twitter. First, I uploaded the sketch/line drawing and then the painted version. Later that morning, I was having coffee with my sister and my phone lit up. Oh my god…“DVF is following me!” and she wrote “I love it. Can I buy it?” I screamed out loud in a quiet coffee shop. World-famous artists like Warhol, Francesco Clemente, Chuck Close, Opie and others have done DVF’s portrait, all of which dress the walls of the DVF NY Fashion House. So to think that my portrait of this inspiring woman would be amongst such incredible talent, well, I couldn’t be more grateful. It wasn’t easy to get in touch with her as I only had her Instagram account, but luckily I was in touch almost every day with the Events Director at W magazine in NY. She put me in touch with Diane’s office and her assistant responded immediately saying that Diane would love the portrait and wants to meet me when I am in NY, and she asked that I bring my portfolio. Well, for the second time, I screamed out loud! We arranged to meet while I was in New York for Fashion Week, and I personally delivered the portrait to her. She introduced me to all her staff, had photos taken together in her incredible office with hot pink walls, gave me a DVF “Secret Agent” leather bag and invited me to her fashion show. Diane hung her portrait that day, and a few weeks later I delivered a sketch of the same portrait she requested, and it now hangs in the Creative Director’s office at DVF. In May 2018, I met Diane again at Suzanne Rogers Presents DVF. Before the presentation and interview of Diane started, I was there painting a portrait of Jeanne Beker, the MC for the event. I heard this voice behind me ask, “How long does it take to do a painting?” I was delighted when I turned around to find it was Diane. She remembered me and we had the loveliest chat. How have you found your art has evolved since you began your portrait-focused work? 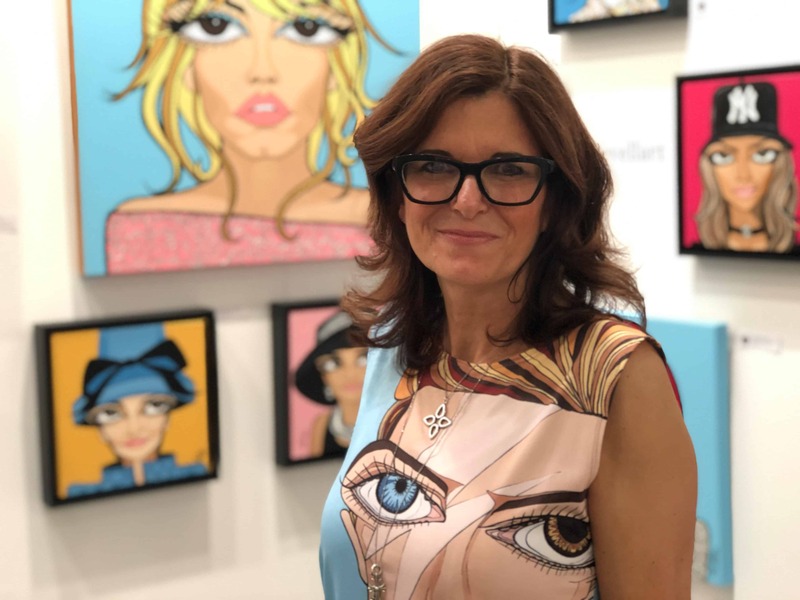 My #WIDEBIGEYES has remained my signature style, but in the beginning, I was a fashion illustrator, painting on paper with loose and fast brush strokes. Within months of transitioning to be a full-time artist, I began painting on canvas and tightening up my brush strokes with fine, steady lines. What is your personal fave out of your latest collection? I seem to always favour my latest piece but overall, it’s TWIGGY. From the painting to the fashion collection, especially the scuba jacket, she is my favourite. I do wear my PRINCE Delirious clothing more than any other pieces; I think it’s the colours that I love the most. What moment stands out to you the most since you started on this new venture? There have been so many exciting moments since starting my art venture, but the one that stands out the most is my opening night at my first pop-up and art show at Yorkville Village this past September. It was a turning point for me and my business. When I decided to try a retail pop-up, I knew it was a risk. My upfront costs were high, and I was gambling that it would be a success. I was hoping to at least sell enough so that I could pay my credit card bills on time. When the opening night happened, it was incredible! We had an excellent turnout from media, clients, family, friends, and I must say when Jeanne Beker arrived, I was ecstatic. I really felt my success that night and all the warm adoration of my work. I am so grateful for everyone’s support. The moment that stands out from this is that my plan worked! Not only could I pay my bills, but I also created an opportunity for myself that proved to be profitable. Not only did it prove that doing a pop-up was a successful way to sell my art and merchandise, but it also taught me that connecting my target market with location was key. What has been the biggest challenge you’ve overcome in your career? Since I represent myself and choose not to be represented by a gallery, it’s definitely more challenging to get the notoriety that represented artists might get. I would like to be in shows like Art Basel or Art Toronto, but you need gallery representation. I will figure out a way and make it happen. Keep my eye on the end result, on the big dream, and not on the little things. It is important to have a dream, a big dream. Visualize what you want, not so much on the details of how to get there, but just visualize yourself there.